Markov process theory is basically an extension of ordinary calculus to accommodate functions whos time evolutions are not entirely deterministic. It is a subject that is becoming increasingly important for many fields of science. This book develops the single-variable theory of both continuous and jump Markov processes in a way that should appeal especially to physicists and chemists at the senior and graduate level. Random Variable Theory. 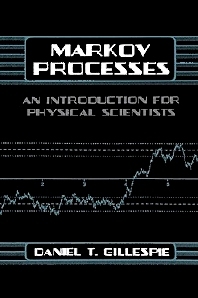 General Features of a Markov Process. Continuous Markov Processes. Jump Markov Processes with Continuum States. Jump Markov Processes with Discrete States. Temporally Homogeneous Birth-Death Markov Processes. Appendixes: Some Useful Integral Identities. Integral Representations of the Delta Functions. An Approximate Solution Procedure for "Open" Moment Evolution Equations. Estimating the Width and Area of a Function Peak. Can the Accuracy of the Continuous Process Simulation Formula Be Improved? Proof of the Birth-Death Stability Theorem. Solution of the Matrix Differential Equation. Bibliography. Index.